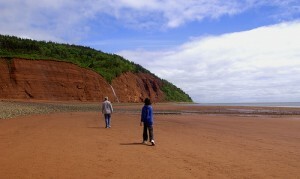 Strolling on the beach at Cape Blomidon Provincial Park. Cape Blomidon Provincial Park in the Annapolis Valley is one of the better known places to go camping, enjoy a hike or beachcomb for semi-precious stones on the Bay of Fundy. High cliffs tower 180 meters above the water, giving you a great view of the world’s highest tides rushing into the bay. When the tide recedes, try beach combing for amethyst or agates or take a hike along one of the 14km of trails before returning to the campground by evening. The park is a good base for campers who also want to hike the trail at Cape Split and visit attractions in nearby Wolfville and Grand-Pré. The campground is open through the summer, with 70 campsites (a mix of wooded and open lots), picnic areas, a beach and hiking trails. A kitchen shelter and fire grills are also available. Among the hiking trails, the Jodrey Trail is the longest at 6km. It takes you over sea cliffs and through a deciduous forest. The appropriately named Look-off Trail takes you on a 1.6km ramble to views of the Minas Basin and Five Islands. The 3.5km long Borden Brook Trail goes past several waterfalls. Directions: Take Exit 11 from Highway 101 and follow Route 358 to Canning, then through Pereau to Cape Blomidon park.